Wow, and I thought there was only one. 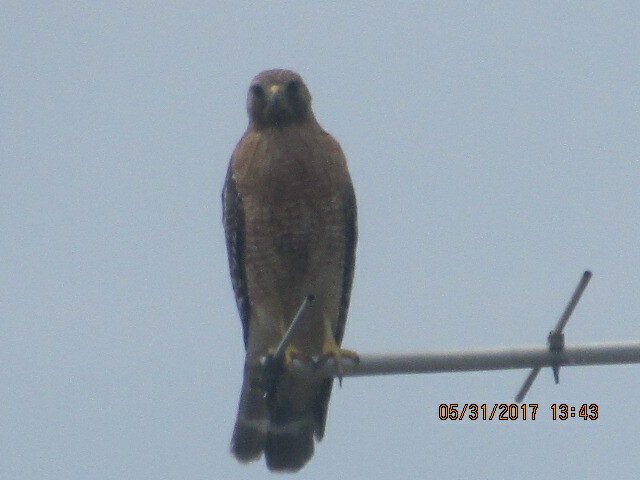 I have taken a lot of pictures of the hawks and have even taken many pictures of the chick in the nest. For days I have taken pictures of the chick alone and being fed. 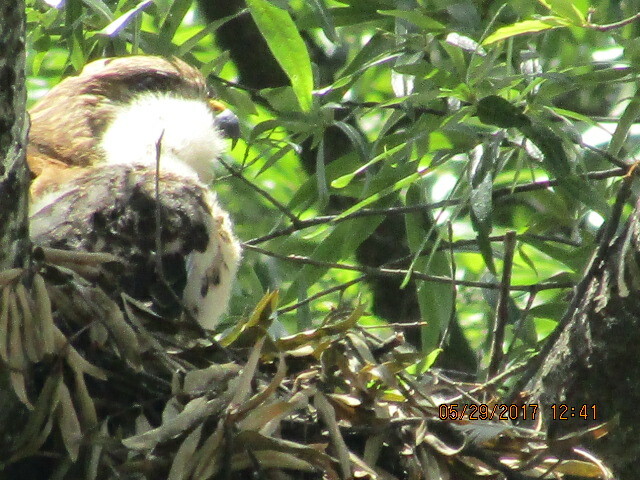 Then, a few days ago, as I was taking a few more pictures of the chick in the nest, I noticed two other birds. At first I thought mama and papa had joined the chick until I zoomed-in. Then I saw three chicks. Can’t mistake the adult birds and the chicks because the chicks still have the ruffled down on them. Pretty, to say the least. On my Facebook page I have posted a few pictures for all to see. If you want to see the pictures I have posted this month and last month, go to the page and you’ll see many pictures of the adult birds and of the chick(s). Now there are three, getting large, chicks. I don’t see how two adult hawks and three medium sized chicks can fit in the nest. Oh well, Mother Nature can do things we thought was impossible. I have mentioned before about the proposed smoking ban at Imperial Plaza; well, nothing have publicly come out but the rumors are everywhere. Some places where people normally smoke have changed to other places but, still, there isn’t anything official. I say that to say this; there is a group of people that get together and smoke outside the main entrance of their building. They can be found there all day and into the late evening. One day, since the purported change, they have moved to the bench where I take pictures of the hawks. I don’t mind because I went there when they left but I wasn’t happy about them being there since it’s their bench also. Why, you are asking? Well, there is a stand-up ashtray beside the bench but these people rather drop their cigarette butts onto the ground when they could use the ashtray . There are a few of us that use that bench and this have never happened before. I hope they get their act together before there is a complete ban. Thinking about fake news (?false news? ), I have been taking pictures of the birds and squirrels around Imperial Plaza for quite awhile. Couple that with many new faces moving into Imperial Plaza. The other day, as I was passing through the Dogwood lobby area, where a few residents usually sit talking to each other, a resident that have resided here for a few years called me over and asked about the hawks and squirrels. I was introduced to the three or four new residents that was sitting there. When the conversation came around to the white squirrel at the main gate and the one behind the Boxwood building, a new resident corrected me by saying there is only one. She told me the one by the main gate is solid white and the one behind Boxwood have an off colored back which make it not solid white. I didn’t say anything. I pulled out my phone, bought-up my photos and showed the resident the white squirrel playing behind Boxwood (it’ll let a human get with-in three or four yards of it). The resident saw that it was white but said the photo does not show the back because the back is not white. I still did not say anything. I then showed a profile picture of the squirrel and one of the rear end. The resident looked startled and sat back into the seat. All smiles and grins left the resident’s face. A new resident and already knowing everything, more than the people that have been here much longer. Beware of things that are told to you without any proof or what you assume is fact without proof. I’m posting a little early because I’ll be gone for the weekend but I want to say to all, have a safe and happy summer. Wherever you are, keep your eyes and ears open to everything around you. The world is much different than when I grew-up (in my day a person did not have to be always watchful), so be on your toes. See ya!! !